We comply with the court orders and do this exactly right. And if we make a mistake, we hold ourselves accountable and report it to everyone. 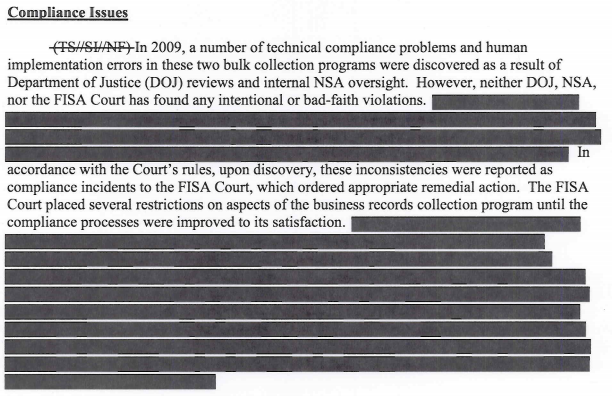 Here’s what the 2011 report on both the telecom and Internet dragnets declassified yesterday said about NSA’s compliance failures (see PDF page 8). As I reported Friday, Ron Wyden and Mark Udall say the Intelligence Committee downplays the seriousness of the violations that have occurred. Their violations of the rules for handling and accessing bulk phone information are more troubling than have been acknowledged and the American people deserve to know more details. 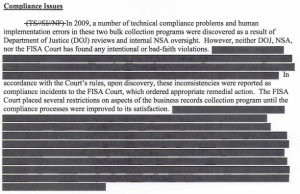 I am not allowed to discuss the classified nature of that, but I want to make sure those who are following this debate know that from my vantage point, reading those documents that are classified, these violations are more serious than have been stated by the intelligence community, and in my view that is very troubling. So I do hope Senators will go to the Intelligence Committee and ask to see those classified documents because I think when they read them–I think they will come to the conclusion to which I have come that, not only is what was stated by the Director of National Intelligence in that letter that was sent to you and me and Senator Udall and 23 other Senators–not only was that correct, but I think Senators who read those classified documents will also come to the conclusion that the violations are more serious than they thought–than the intelligence community portrayed. After Alexander’s speech yesterday, CNBC asked further questions, including specifically about Wyden’s claims. CNBC: General Alexander, Senator Wyden said yesterday that phone records collection abuse has been more significant than the government has acknowledged. What do you say about that? Alexander: I’m not sure what he’s referring to, so I don’t know without him being more specific. If he could be. I think, um, maybe we should have a discussion on what that means. I’m not actually sure where that “if he could be” fits syntactically in Alexander’s response. But here’s why Wyden can’t provide more specifics. Alexander, who is a classification authority (though James Clapper may be the classification authority for the 215 program), responded to a question about abuse by demanding that Wyden, who is not a classification authority, provide more details about something that NSA and ODNI have specifically kept classified. Later in the interview, Alexander told CNBC it could help. Just reporting what somebody says is not the right thing to do for our country. Let’s put the facts on the table. If you just blindly take what somebody says, I think that’s not what our nation needs. Yet blindly taking what somebody says about government abuse is precisely where Alexander and Clapper have left American citizens. https://www.emptywheel.net/wp-content/uploads/2016/07/Logo-Web.png 0 0 emptywheel https://www.emptywheel.net/wp-content/uploads/2016/07/Logo-Web.png emptywheel2013-08-01 12:44:292013-08-01 12:44:29Keith Alexander: We Report Violations to "Everyone"
It was a conversation, full of incomplete sentences and phrases that just hang out there, not a prepared document that’s gone through Teh Grammar Checker. But the meaning seems very clear: you (CNBC) are not going to get to hear anything about this. It’s not just where they left us, but it’s the place they took us to. Re the title of the post: Where’s Inigo Montoya when you need him? general alexander has proven himself to be a serial liar, a natsec bureacrat who is a master at evading, misleading, misinforming, a strong proponent of keeping his personal “spy empire” hidden from congress, from the american people, and quite possibly from the president and his highest natsec advisors. leaders like general alexander are mistrusting, sneaking, fearful leaders and, as such, very dangerous to a government like ours. so why does our defender-in-chief not fire general alexander? It must chap the asses of Clapper and Alexander that, in the world made possible by Edward Snowden, “trust us” doesn’t seem to be as well-received as it once may have seemed. Not that these clowns are in prison (yet), or anything, but there’s got to be a point at which somebody in the room will start openly snickering when they mouth these kinds of comments. Thanks, EW, for setting that table. When will a reporter “in the room” offer up such a reaction — like, maybe, a follow-up question — instead of the stenography we’re still getting?